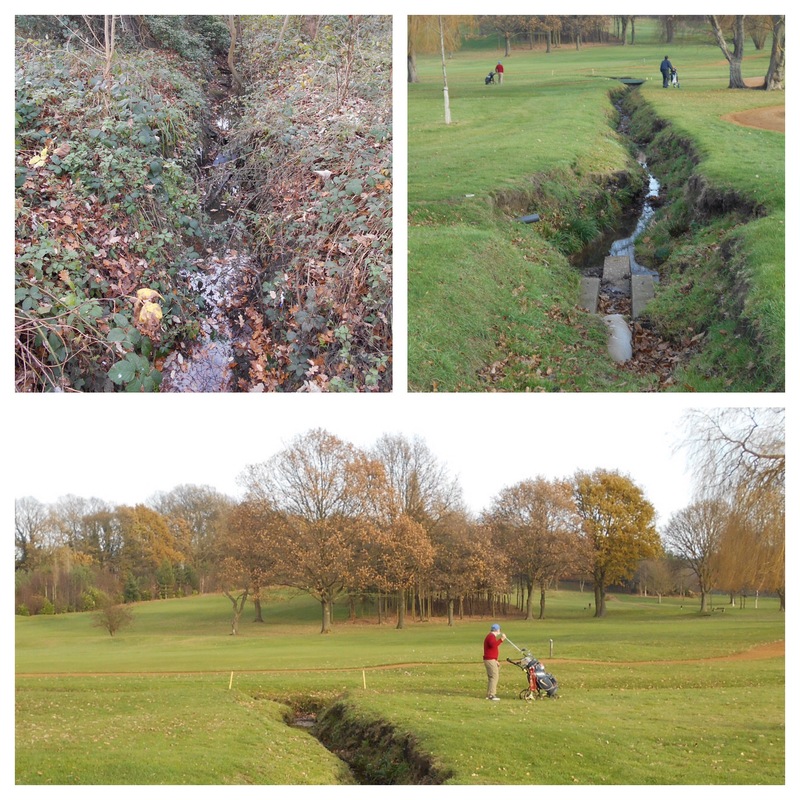 There are a series of tributaries of the Quaggy that run (or in some cases ran) through the golf courses of Sundridge Park – most of these are unnamed and we will return to them in a future post –but there is one which is visible and complete with appellation which we will look at first – Milk Street Ditch. Before passing on it is worth noting that the designation ‘Ditch’ should not be seen as either derogatory or belittling of its importance, it is just the way in which streams are described in these parts; there is a neighbouring Border Ditch and Grove Park Ditch. One or two streams in the area do get offered slightly grander names – the most obvious being Fairy Hall Flow, which, unlike the Ditches, seems bereft of water. The name comes from the street, the street name relates to a dairy farm – Hall’s Farm. 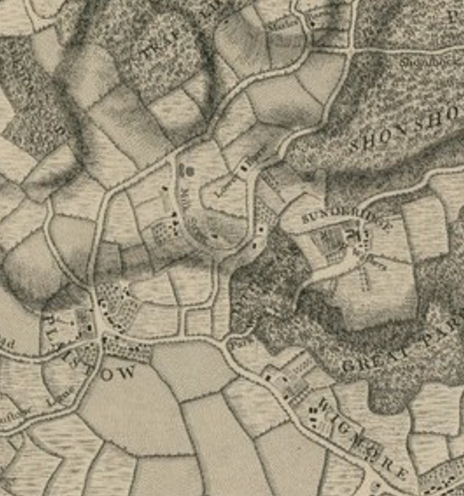 It may have been one of the ‘dots’ marked when Roque surveyed area in the 1740s (see above – via Creative Commons) and was certainly there from the earliest Ordnance Survey maps (via National Library of Scotland on a Creative Commons). 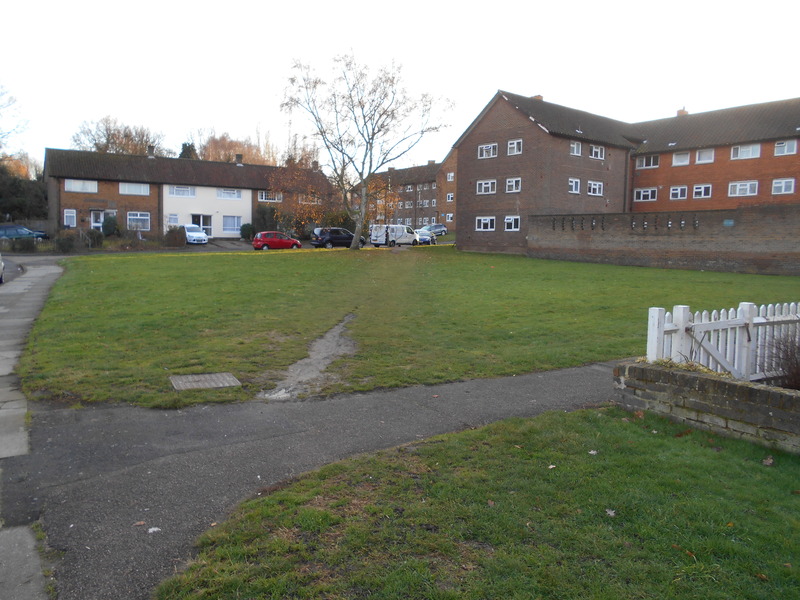 The fields are long gone – a mixture of housing covers its acreage, ncluding an area sometimes referred to as the Hall’s Farm Estate – through which flows/flowed another small unnamed tributary of the Quaggy – which we have already covered, as well as the Quaggy itself hidden in concrete piping. The farm house is still there and is now a nursery – it is of children though, rather than any tenuous link to farming past. 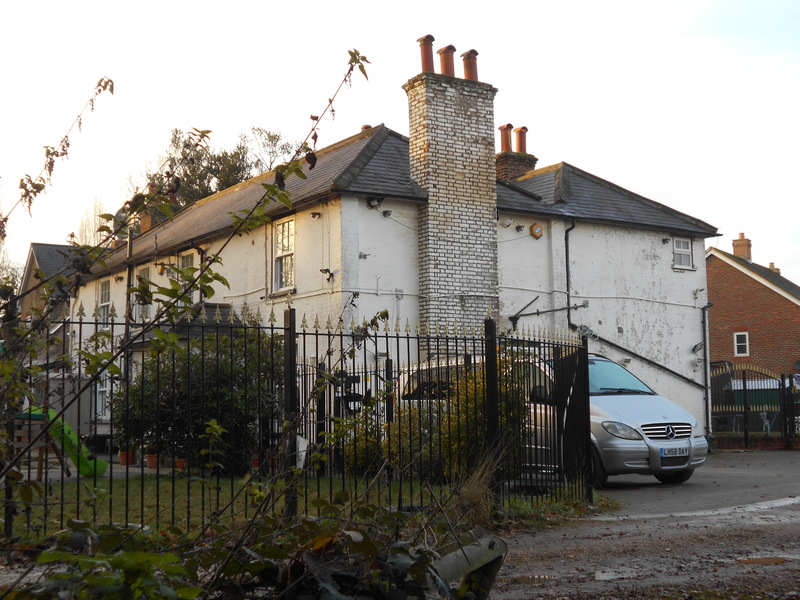 Although it may not be there for much longer, plans were afoot, at the time of writing (December 2016), to demolish the locally (but not nationally) listed farmhouse and replace with 8 four bedroom houses and one eight bedroom home. There is scarcely room for a stream to emerge here – the watershed with the Ravensbourne is only a hundred and fifty metres or so away on the opposite side of Burnt Ash Lane and the source of Spring Brook that heads through Downham Parkland to join the Ravensbourne barely 300 metres away. 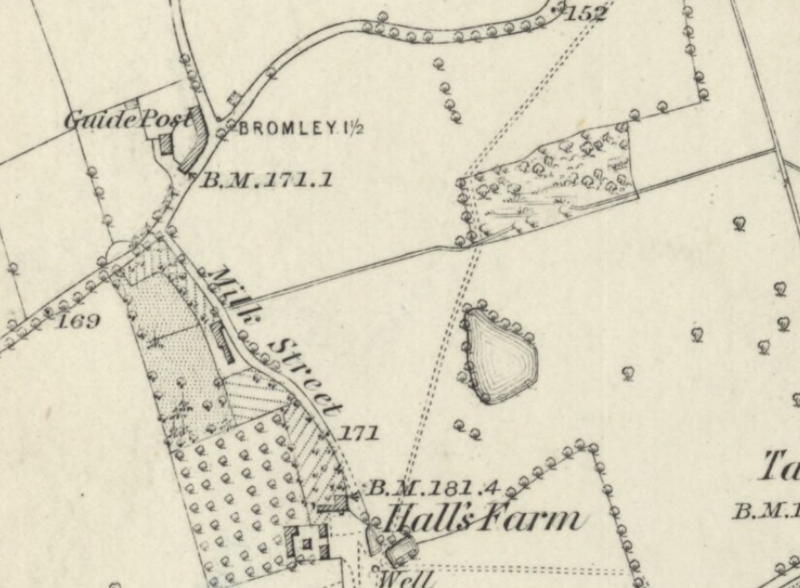 The source is currently unclear, but seems, from old OS Maps, to be on what is still a small green in from of some probably largely ex-Bromley Council homes. There wasn’t anything obvious in terms of either damp ground or the sounds of subterranean rushing water than would pinpoint the source or its early flow. There is though a slight, but perceptible, dip in Milk Street which would take the young Ditch towards the railway Bromley North Branch Line which opened on New Year’s Day 1878. The Ditch’s emergence into the open is in Hall Farm Allotments – sadly on a chill December Sunday afternoon there was no one visibly tending their patches, presumably at home enjoying the fruits (and vegetables) of their labour. 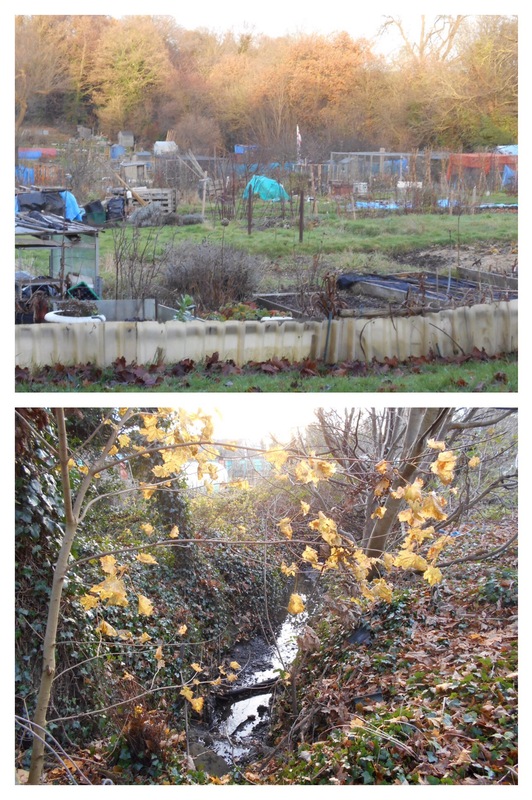 Fortunately some of the stream flowing through the allotments was visible through the fencing protecting it from the narrow corridor of the Green Chain Walk; in other seasons it would have been easy to miss though, as the boundary chain link was covered with leafless, deciduous foliage. Across the Walk there is a boundary of a different sort, much more sturdy 2 metre plus railings which hug the edge of the West Course of Sundridge Park Golf Club. Some of the metal fencing was re-enforced to ensure that it was a little less porous, with holes considerably smaller than the 41.1mm diameter of a golf ball – presumably to prevent a wayward shots hitting the unsuspecting Green Chain Walker. The Ditch was just visible but is much better viewed from the other side of the fence. The helpful people at Sundridge Park Golf Course allowed me to wander around part of the course, insisting, quite reasonably, that I stuck to their well-made paths and wore hi viz attire – my normal cooler weather running apparel anyway – although a few eyebrows were raised as staff took me through the lounge – lycra short tights are probably a breach of the standard dress code. The dayglo was indeed necessary at one point, as an over hit approach shot was followed by the bellowing of ‘fore’ and a small thud way beyond the ball’s intended target green. The Ditch enters the golf course through some heavy rough before being briefly piped under the approach to the 12th green then emerging into the open as a hazard on the beautifully manicured fairway of the 393 yard 13th. Its course is straight (unlike one or two of the drives witnessed whilst wandering) and partially marked by small flags, before quickly it joins The Quaggy – little more than a 9 iron shot from its entrance onto the course. Golf courses are generally not places I frequent, but on a mild, sunny Friday lunchtime with a relatively quiet course and the backdrop of pleasant undulating park with the last remnants of the autumn, I could see the attraction. The stream feeds a pond (which may have an artificial source too) – it is carefully positioned just after the last tee to trap those topping their final drive. It was orginally a farm pond though and is marked on the OS map. When I passed it was ‘guarded’ by a heron, so presumably there were contents other than Titleist Pro V1. The stream then flows on and joins the Ditch near the 12th green – although from both the path and satellite images, this wasn’t obvious. Finally, thank you to the Golf Club to allowing me access to the course and apologies to any member or paying visitor for any distraction my rather conspicuous presence caused to their round of golf (or their drinks at the 19th hole for that matter). This entry was posted in Rivers and tagged Hall's Farm - Bromley, Milk Street, Milk Street Ditch, Quaggy, Sundridge Park, Sundridge Park Golf Club on December 15, 2016 by Paul B.